Sunday was a Jamie Oliver inspired Chicken in Milk. Roasted in a tight fitting pot in milk, its weirdness intrigued me. I didn’t have any sage and decided to peel the garlic cloves but otherwise I pretty much stuck to the recipe. First of all find a pot that the chicken will fit into but be snug. Put oven on to pre-heat to Gas Mark 5. Heat the olive oil in your pan. At this point I attempted to brown the chicken but ended up with the skin sticking to the bottom of the pot, I think I should have stuck to my instinct and used butter. Having managed to brown some of the rest of the chicken without denuding it further, it is time to add all the rest of the ingredients to the pot (off the heat – you don’t want your milk boiling whilst you are still trying to zest your lemon) plus a good dash of black pepper. Put the pot in the oven and cook for about an hour and a half – basting as and when you can, I turned my chicken half way through and basted it a couple of times. We had this instead of our usual gravy filled roast dinner. Good points – the chicken was really beautifully tender and moist. Bad points – I really didn’t like the sauce, I was expecting it to split the milk but we ended up with glop, it was tasty enough just not entirely to my taste. So that’s the cook once bit done, what about the eat twice? Well cold chicken is always useful, we have wraps and sandwiches for lunch but in the spirit of thriftiness I though I’d also add a second recipe with a little (but really not much) cooking to revitalise the leftovers. This is where the meal plan went a bit off-piste (or off-plan at least). Monday was supposed to be pie and mash using something akin to this Chicken Pie recipe. So what went wrong? A power cut in the afternoon meant my kitchen was too dark to see properly and I couldn’t use my mixer to flake the butter into the flour. The Other Half had to travel to a local town for work and was going to be late home, so the Small Person and I popped into the local pub for Happy Hour – this involved a lot of chatting, being an hour later home than planned and me failing to make pastry for the pie. I hadn’t got any shop bought and I needed to make sure the Small Person ate at an appropriate time still. And so we made pie without pastry, the pie filling made the way I had intended just without a shortcrust top. I almost regretted the lack of pastry as the filling was delicious (I got told off by Small Person for saving some for when Daddy got home – apparently she wanted his share). This recipe was doubly good for leftovers as not only did I use up most the leftover chicken (and there was still some for the Other Half to use in wraps and sandwiches for lunch) I also diced up some leftover vegetables. All quantities below are approximate – if you have no or very little left over vegetables, bulk out with an onion (fry with the bacon) or carrot for example. I think I’ve read that Jamie Oliver recipe and thought it sounded interesting but unusual. Not sure I’ll ever make it now! I love roast chicken though and it always makes a good meal with plenty of leftovers for the next day. 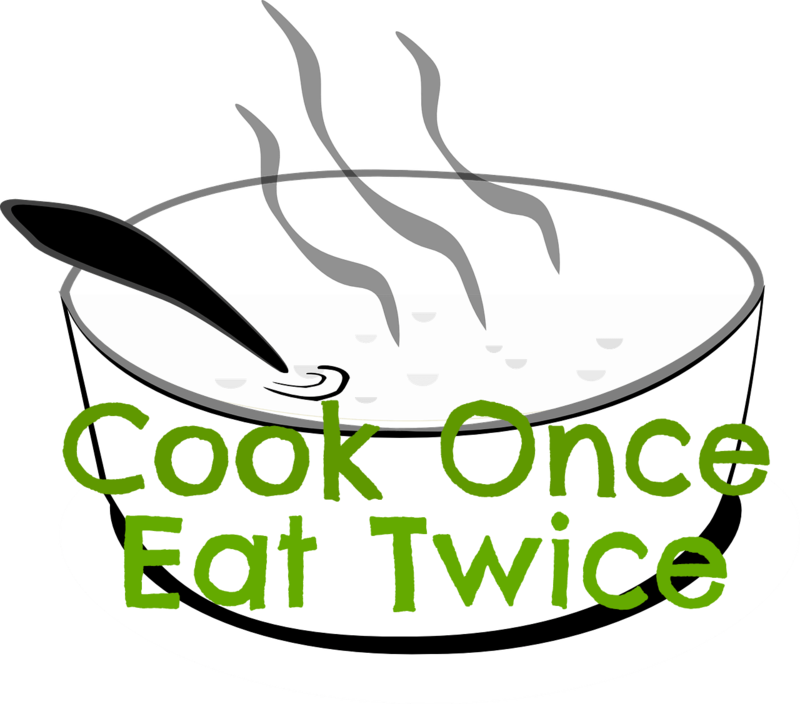 Thank you so much for joining in with #CookOnceEatTwice!